Last week, I read an article on venturebeat.com, describing Nancy Pelosi’s “awe” for the maker movement. The article was old, (published January of last year), but I was still happy to see this opinion vocalized, being a maker-educator, myself. 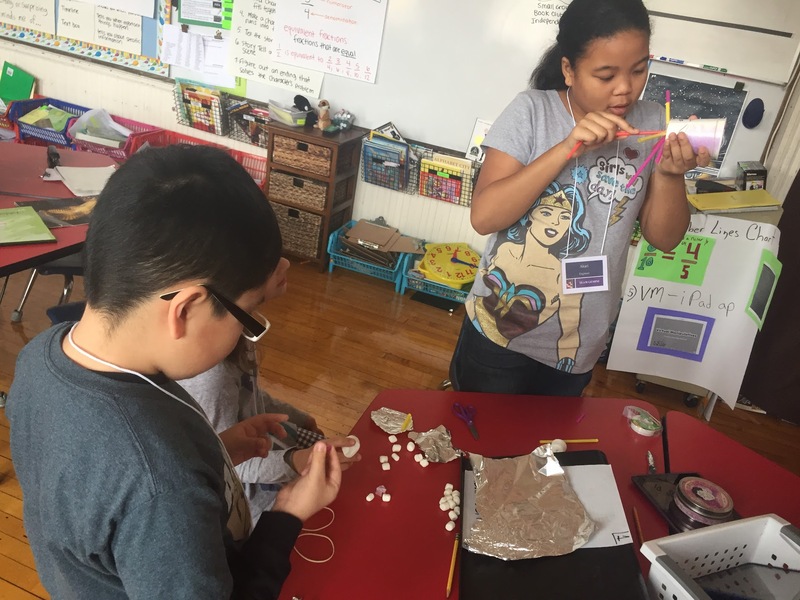 We call our makerspace the “Creativity Lab.” In six years it’s grown from a single robotics elective into a full-blown making program at a community charter school in Oakland, CA. The Creativity Lab is a colorful, 640 square foot room, with tubs of motors, batteries, Popsicle sticks, and whatchamacallits, but, as much as possible, we try to integrate making into each of our K–12 classrooms. Having gone through the process of slowly designing and redesigning our own making program, last year we started offering professional development sessions to help other educators do the same. We get good attendance. People are interested in the all-powerful maker movement. It’s big! It’s exciting! It’s—trendy? Here’s a question: How do you integrate making into an English class? This question and other of its ilk are pretty common at our professional development sessions. Adding making to math and science classes seems pretty straightforward—any sort of engineering challenge has each of these subjects out the wazoo. But the humanities seem trickier. So how do we do it? And why do we want to? Actually, I happen to think making already happens in the humanities. I call short story writing “making.” I call dramatic performances “making.” The same goes for cooking, photography, sewing, painting. And yet, we still get these teachers at our sessions asking how they can add making to their lesson plans. Aren’t they already doing it? Are they missing the point altogether? Am I? What’s the difference between an art class and a making class? Just recently we had a gathering of self-proclaimed makers, in which we tried to tackle that very issue. The result was inconclusive. It’s interesting that so many people want to hop on board the maker movement, when we haven’t even definitively tackled what constitutes making. Maybe writing and drawing classes just feel too routine. Maybe they don’t push the boundaries enough. Out with the old, and all that. I get it. I will say that the making we do at the Creativity Lab tends to have an element of empowerment to it. Our kindergarteners use handsaws and hammers on an almost daily basis. By the time they’re seniors, they’re using laser cutters better than most of our teachers. Imagine going into a technical college and already having that sort of experience. See, making is great as a means. A means of giving students ownership of their learning. A means of keeping classrooms engaging and exciting. A means of facilitating deep conceptualization. Not to mention the persistence, skill-building, and practical experience that almost inevitably go with it. That’s the “why.” And the “why” is paramount. As far as I’m concerned, the making, itself—well, that’s just lagniappe. In January, the question of integrating making into an English class came up again, when two teachers from San Diego attended one of our sessions. Their solution was a spin on an exercise called “Parts, Purposes, Complexities” (PPC), that comes from Project Zero—a research group at the Harvard Graduate School of Education. Our two attendees proposed to have students look critically at a piece of literature, analyzing how the different elements of the writing worked together to form a whole. So, taking Hemingway’s Hills Like White Elephants, students might look deeply at how the setting of the train station works in conjunction with the third person point of view, and so forth. Uh-huh. I ask you: which exercise—the literary analysis, or the laser cutter—gives students a deeper understanding of Ernest? Don’t get me wrong. I still think there’s room for effective and meaningful making in the humanities. Take, for instance, those short story classes that maybe don’t have quite the oomph that we’d like. Aren’t they engaging? Don’t they give students ownership of learning, by asking them to share their work with fellow classmates? Sure—some. It hardly stretches them, though. Better yet might be telling students they have three months to submit a short story to The New Yorker. Give them the practical experience of submission and rejection. Motivate them with the cash prize for accepted pieces, and the opportunity to be published in one of the most recognizable publications across the world. Will any of them actually succeed? Doubtful—but the failure will likely push them as much as success. If they do get accepted, I suggest giving them the A. And don’t try to fit the square block in the circle hole.